You gotta notice the great design as soon as you land at this website. It’s sleek and looks modern. The live chat immediately gets active, with a representative asking if you need some help. However, the customer support department turned out less supportive than expected. I placed an order for an essay, and the writer was completely unresponsive. The support system didn’t work 24/7. The essay, however, was delivered on time and it wasn’t bad. Providing rating for the writers is a nice touch. You can see how many orders the writers have completed, and you can see what feedback the customers left. However, this section of the site looked a bit shady. Dare I say – fabricated? There are no names, and the photos of the writers are fake. You can get any type of essay, admission essay, case study, book review, term paper research proposal, and many other types of content. The team also offers services of reflective writing, which I haven’t seen on many other websites. Editing and proofreading assistance is also available. As for the guarantees, they are not stated very clearly at the website. There are solid guarantees for timely delivery and 100% plagiarism free content, but what about the free revisions, refunds, and satisfaction policies? I had to explore the terms and conditions to get that information, and I found nothing. If you’re able to find this information at the website, please comment below this review and I’ll update this section. This is a service that works on the bidding principle. The minimal price for an essay with a deadline of 2 weeks is $12 per page. If you pick the shortest deadline of 6 hours, the minimal price will be $18 per page. When you place your order, you’ll get various offers from different writers. For my essay, with a deadline of 7 days, I got offers that ranged from $18 to $25 per page. I chose a writer who offered an average price – $20 per page. As usual with companies that work with bidding, there are no discounts. This is where things got interesting. When you’re working with a bidding service, you expect things to go smoothly because you’re constantly connected with the writer. Well, it didn’t work out that way. Fortunately, the essay I got wasn’t bad. It had some flaws, mainly because the sentences were too short and it looked more simplistic than you would expect for an academic paper. The writer agreed to make minor revisions, and the final result was slightly better. Still, not perfect. I tried to get feedback from the writer several times, but I didn’t get a response. Two days before the deadline, my writer responded: “Please don’t worry. The essay will be ready on time.” But, I didn’t get a draft or updates on the progress. The customer support system doesn’t work, since you’re supposed to sort things out with your writer. You choose your own writer at this website. That’s the most notable feature to mention. You can see the feedback the writers got from previous customers, and you see what topics they qualify for. In conclusion, I got an average essay for an average price. The customer support service was disappointing. 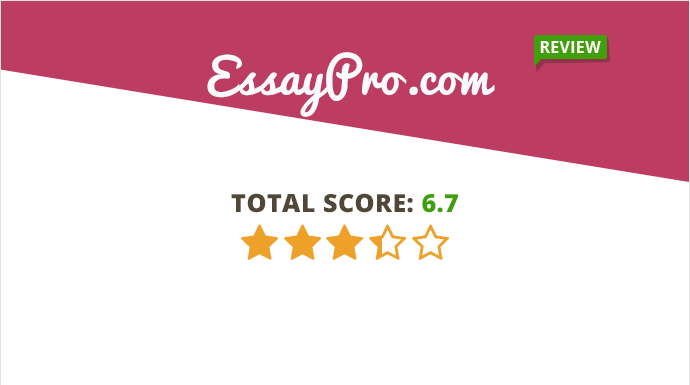 Have you ever ordered a paper from Essay Pro? What do you think about this service?